Although this code lays out midi note values for 5 octaves, I only seem to be able to get a max of 4V at the output (via MCP4822 dac). I'm something of a noob with Arduino and not yet savvy enough to identify the problem if indeed there is one (the build docs are minimal).I've got a pcb laid out for this, its breadboarded (with a few extra features) and works a charm except for this limited range issue Any ideas how I can get the full 5 Octaves would be gratefully received. Cheers! (schematic further down the page). 1) scale the output to 5v.... which is simple, and adjust the code accordingly, .....which I would have no clue where to even start! You should add an op amp with a trimable gain to get you to 0 to 5V. That will be your 1v/oct output trim. The code doesn't need to change any, It's just an analog adjustment of the gain after the DAC conversion. Check out the schematic for my quantizer at clsound.com on the modular synth page. You can see the output trim on the digital board. I used a different converter, and I boosted the gain up to 0 to 10V but the idea is the same. 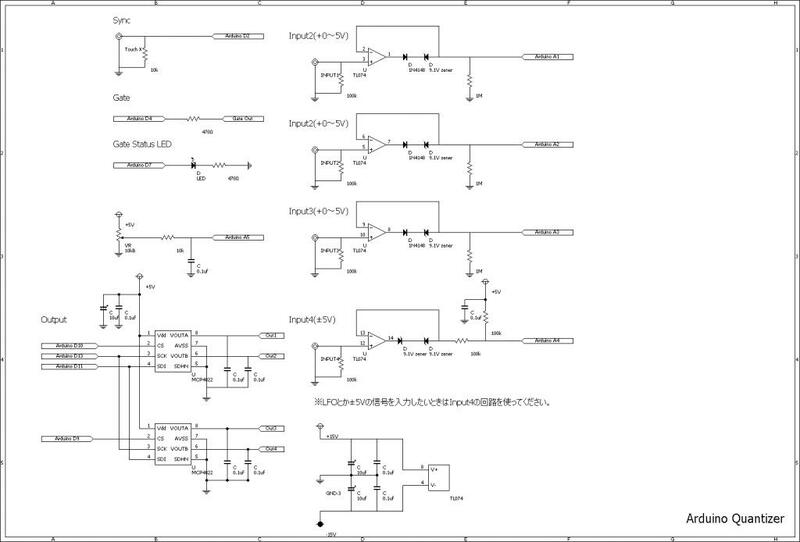 You can ignore the vast majority of the schematic, just look at the op amp after the MCP DAC. Craig thanks again for your advice . I'm not sure if that's the solution though. At 4V the scaling is 1V/Oct perfect at the (quantized) dac output, so stretching the range to 5V would surely destroy the scaling. Bricks, do you happen to know what changes would be necesary to output at 1.2v/octave scale? You use this scale right? I'm intersted in ways of achieving quantization for 1.2v scale. You mean in my illucia stuff? None of that (so far...!) outputs voltage for modulars. They're all just controllers with state for routing things on computer. I have been dabbling with CV<->OSC lately though, and messing with this very DAC. but I'm pretty sure that in both cases (1.2v, or the OP's 0-4v scaled to 0-5v) the code would need to change, no? I don't think a quantizer would be particularly hard to write though.. might need some hand tweaking but nothing too crazy if you're just looking for 12 tone stuff. As far as your code goes the voltage is irrelevant. Your dac is 12 bit so it can represent 4096 values. You want 5 octaves so that is 60 semitones. 4096/60 = 68.26. I would round that 68. Btw interesting idea, I just ordered the same dacs to try out with the arduino. I'm not sure if my DAC is any better than yours. I've been experimenting a little and different actual chips seem to be giving my varying amounts of linearity. I need to compare the sheets of yours and the 4921. As far as scaling goes, I seem to be doing things a little differently than you. In mine I do a AD conversion which is 10 bits, for semitones I then drop the bottom 3 bits (I actually drop 2 because I'm working in quartertones). The input is scaled to convert to 120 (when the bottom 3 bits are dropped) at 10V into the module. That number is then the offset to a scale table. All my scale tables are the same size, they just repeat numbers. For semitones there are 120 values. for wholetones there are 60, each one repeated twice. I then scale the output of the DAC back up so a ADC'd value of 120 equals 10 volts at the output of the module. Guys what value should those zener diodes be on the buffered inputs to limit the voltage into the Atmega to 0-5V? Does this protect against negative voltages? Edit: Ah so Input 4 allows +/- 5V because of the zener pair but the other three inputs clip at -0V? Does someone know the maths for calculating the zener voltage in these cases please? i don't think there's a great deal of difference between mcp482x and 492x, except the one can be supplied with an external vref and the other can't. anyways, your 4v sound about right, when powered from vdd 5v and setting it to 2x gain (cf the equation 4.1 in the datasheet), so probably that code is a little misleading? either way, as the others have pointed out, amplifying will give you a greater range, even say 8, with some tweaking. i wouldn't worry too much about messing up the scale, the adjustment/calibration can always be done in software - there's already some floating points mulitplications in there so the code above doesn't appear to be particularly optimized towards some particular output voltage. I've recently become very interested in different scales and more importantly temperaments and tuning systems. I recently got an ADDAC 207 which is great but the thing I was really hoping it would do, that is the ability to change temperament, is not flexible at all. I would like a quantizer where I can design the scale and temperament myself. I have a strong programming background so can work out code examples.. looking at getting an Ardcore and Arduino Nano to check this out at some point. DIY seems to be the way forward for my needs! First: EXCELLENT project! The scales are exactly what I'm looking for! But the Arduino freezes when I'm not..... touching pin 2, the clkPin. I've got serial prints going on, and it'll halt mid-line unless I touch pin 2. If I tie pin 2 high (or to 3.3 or REF), it runs great, but the tmp_midi_note numbers are all zero. If I ground pin 2, it stops. If I digitalWrite to pin 3 high and then low every 10 milliseconds, and bridge pin 2 to pin 3, it stops. I know I'm kludging like crazy here, and there is totally a proper solution, but it's beyond me! LOL. The clock input is referred to in the schematic as "sync" and I suppose should be labelled "gate input"
From what I can recall .. If you send a gate signal from your ribbon controller to the sync/clock input the quantization should work a bit like a sample and hold with the output being a quantized voltage relative to that present at the input when the gate is received. I see. Thank you for replying! That would be a useful feature -- I was considering implementing some sort of s&h to the ribbon, I'll try to understand what's going on. I won't be using SPI at all -- that's for the DAC chips if I'm not mistaken, and I'm just going to use Arduino's quick'n'dirty PWM analogWrite function. With smoothing, obvs. So I'll try removing that code and seeing if it's happier. I was looking at your code of the arduino quantizer, i would like to test it! By the moment, i was studying the code and i saw that the semitoneShiftPin is on A5, but the DAC mcp4725 already is using this pin (A4 for SCA and A5 for SCL). So, i just change the Analog pin for the "semitoneShiftPin " to another one and is ok?